This is a paper HERE that Vyvyan Howard and I had fun writing a few years back and published in Chance magazine. It's a popular science type article on “Ancient Geometry, Stereology & Modern Medics”, that was originally written in 2002 and which I have recently tidied up into a PDF. It links ancient ideas in geometry with random sampling and state-of-the-art scientific imaging. 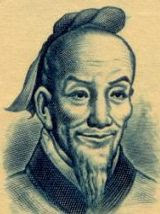 One of the key characters is a famous mathematician Zu Gengzhi, who had a famous mathematical Father Zu Chongzhi (in the picture). "The volumes of two solids of the same height are equal if the areas of the plane sections at equal heights are the same." Then the volumes cannot be unequal.